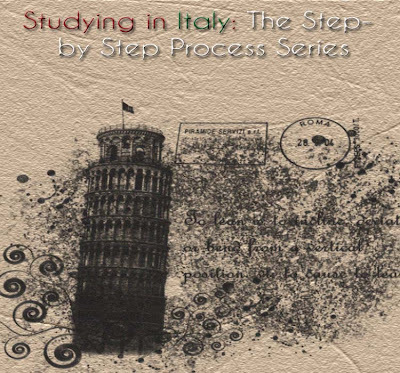 Last week I promised you guys that I would start a step by step series on how to study in Italy and give you the advice that I needed but did not have which caused my studying here to be problematic. In fact, if I would have known this information I would not be giving up on school but alas, I made the mistakes so that you won't have to. In order to apply for school in Italy you must go to the Italian Consulate general associated with your state or city. However, that is the last step. First, I must tell you the first step. To attain the rules for applying to universities in Italy and seeing a list of curriculums and universities available you must go to the Study In Italy website. There you will also find the step by step process (with a few important observations missing) for applying to your university of choice. Studying in Italy is a challenge within itself but it is well worth it because of the low costs. Most universities cost about €1400 per year for course work and in most cases you do not have to buy books because the texts are given to you. Considering the cost of studying in America, this is a better alternative for those who want to and are willing to learn Italian and live abroad. What you must know upfront, however, is that you are only allowed to apply to one university. Make your choice wisely, because this one choice (and the city of choice) can determine whether or not you are successful. I will write part two of the process next Tuesday. Below I have written a mini-list of studies and the universities that are known for them. 3 comments on "Studying in Italy Step 1--Choosing a University"
This is so cool. I remember all the help you gave me when I was trying to figure out how to study abroad in Paris. It was so helpful. Maybe one day I can study there for a semester either spring or fall. OR maybe that's where I can teach English after I have my one year in SK. Oooh, the possibilities. Thanks for being an inspiration. Have a great time in Italy.